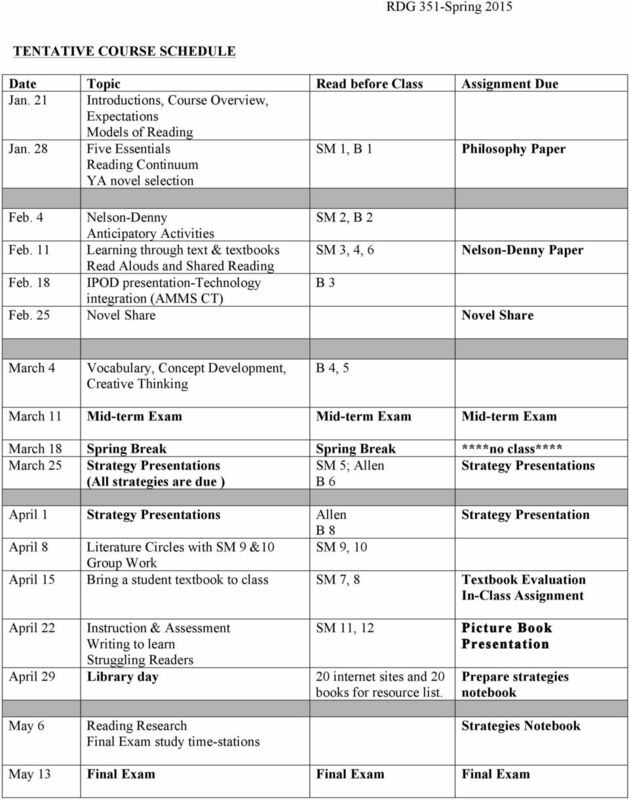 Download "Texas A&M University Central Texas RDG 351.110-Content Area Reading Spring 2015- Wednesday 6-9:00"
2 8. Explore internet resources for secondary content area reading teachers and use technology to develop instructional materials and strategies 9. Demonstrate the ability to take a piece of writing entirely through the writing process. 10. Demonstrate improvement in writing skills. 11. Understand content standards as the foundation of effective teaching. 12. Promote learning for all students by understanding all aspects of student diversity (i.e., cultural, linguistic, developmental). 13. Recognize personal biases and differences that may affect one s teaching. 14. Promote the continuous professional learning process. Prerequisite: nine hours required English. Competency Course Goals and Objectives: Upon successful completion of this course students will recognize the importance of and have the skills to address specific reading needs of students within their content area classrooms. The learner will be able to:! exhibit knowledge of research-based reading theory,! demonstrate a knowledge of current issues associated with reading instruction,! demonstrate knowledge of reading strategies,! exhibit knowledge of the characteristics of diverse readers,! demonstrate knowledge of the principles and practices of assessment and remediation of students as readers,! evaluate textbooks,! 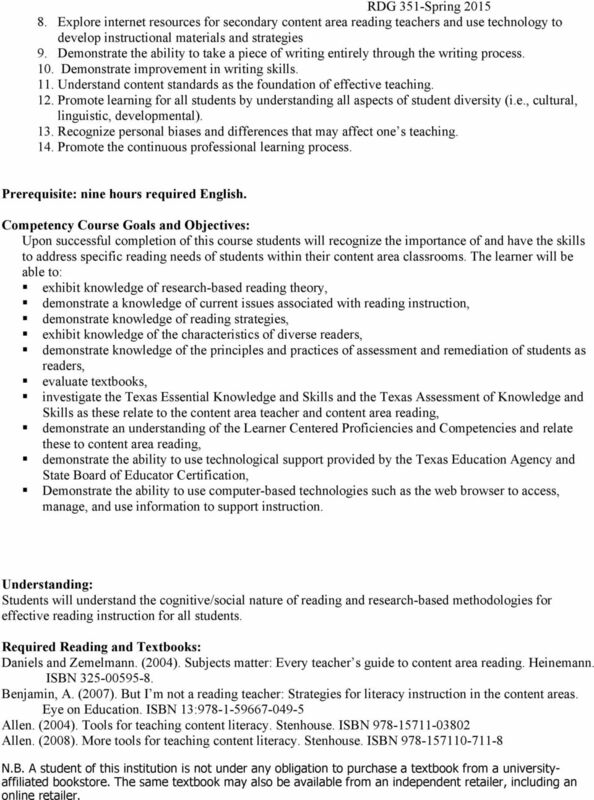 investigate the Texas Essential Knowledge and Skills and the Texas Assessment of Knowledge and Skills as these relate to the content area teacher and content area reading,! demonstrate an understanding of the Learner Centered Proficiencies and Competencies and relate these to content area reading,! demonstrate the ability to use technological support provided by the Texas Education Agency and State Board of Educator Certification,! Demonstrate the ability to use computer-based technologies such as the web browser to access, manage, and use information to support instruction. Understanding: Students will understand the cognitive/social nature of reading and research-based methodologies for effective reading instruction for all students. Required Reading and Textbooks: Daniels and Zemelmann. (2004). Subjects matter: Every teacher s guide to content area reading. Heinemann. ISBN Benjamin, A. (2007). But I m not a reading teacher: Strategies for literacy instruction in the content areas. Eye on Education. ISBN 13: Allen. (2004). Tools for teaching content literacy. Stenhouse. ISBN Allen. (2008). More tools for teaching content literacy. Stenhouse. ISBN N.B. A student of this institution is not under any obligation to purchase a textbook from a universityaffiliated bookstore. The same textbook may also be available from an independent retailer, including an online retailer. 3 Student Learning Outcomes related to Technology Components: Technology Applications Standards II. IV. All beginning teachers identify task requirements, apply search strategies, and use current technology to efficiently acquire, analyze, and evaluate a variety of electronic information. All beginning teachers communicate information in different formats and for diverse audiences. 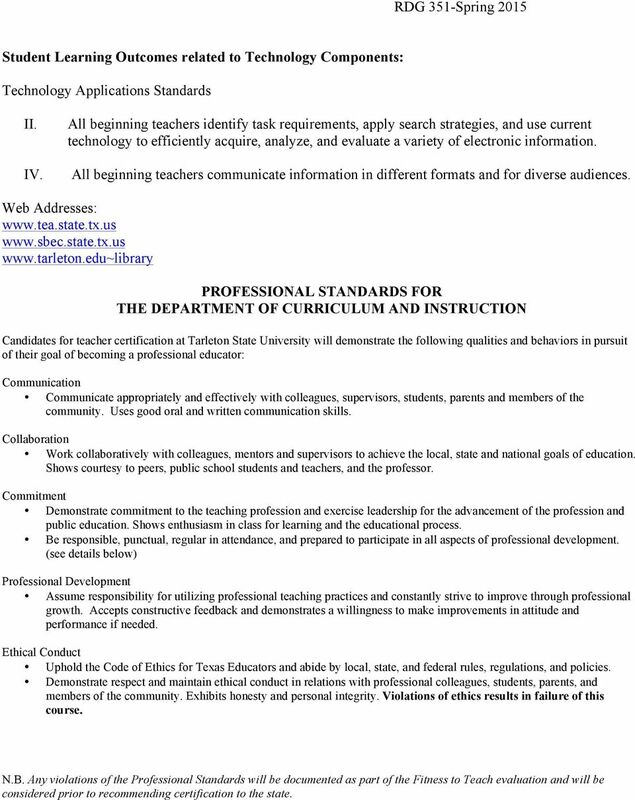 Web Addresses: PROFESSIONAL STANDARDS FOR THE DEPARTMENT OF CURRICULUM AND INSTRUCTION Candidates for teacher certification at Tarleton State University will demonstrate the following qualities and behaviors in pursuit of their goal of becoming a professional educator: Communication Communicate appropriately and effectively with colleagues, supervisors, students, parents and members of the community. Uses good oral and written communication skills. Collaboration Work collaboratively with colleagues, mentors and supervisors to achieve the local, state and national goals of education. Shows courtesy to peers, public school students and teachers, and the professor. Commitment Demonstrate commitment to the teaching profession and exercise leadership for the advancement of the profession and public education. Shows enthusiasm in class for learning and the educational process. Be responsible, punctual, regular in attendance, and prepared to participate in all aspects of professional development. (see details below) Professional Development Assume responsibility for utilizing professional teaching practices and constantly strive to improve through professional growth. Accepts constructive feedback and demonstrates a willingness to make improvements in attitude and performance if needed. Ethical Conduct Uphold the Code of Ethics for Texas Educators and abide by local, state, and federal rules, regulations, and policies. Demonstrate respect and maintain ethical conduct in relations with professional colleagues, students, parents, and members of the community. Exhibits honesty and personal integrity. Violations of ethics results in failure of this course. N.B. Any violations of the Professional Standards will be documented as part of the Fitness to Teach evaluation and will be considered prior to recommending certification to the state. 5 texts. 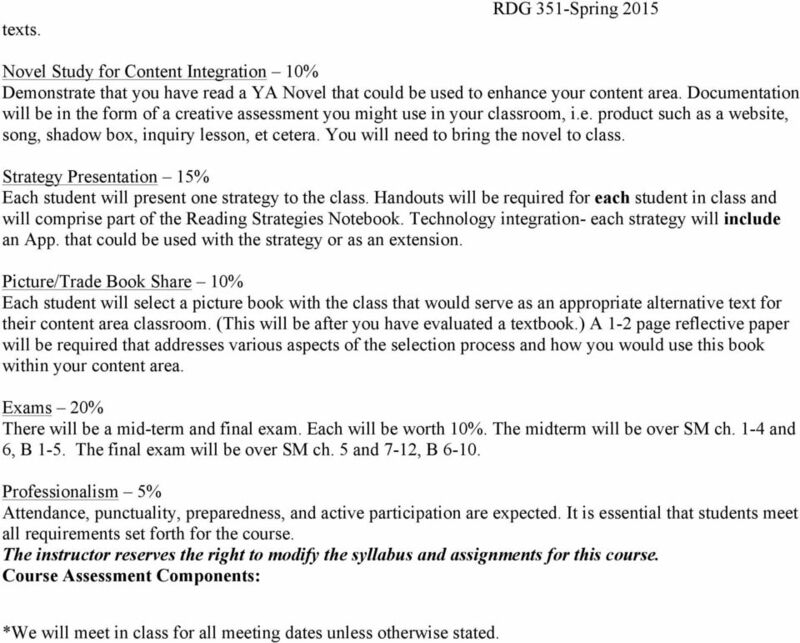 RDG 351-Spring 2015 Novel Study for Content Integration 10% Demonstrate that you have read a YA Novel that could be used to enhance your content area. Documentation will be in the form of a creative assessment you might use in your classroom, i.e. product such as a website, song, shadow box, inquiry lesson, et cetera. You will need to bring the novel to class. Strategy Presentation 15% Each student will present one strategy to the class. Handouts will be required for each student in class and will comprise part of the Reading Strategies Notebook. Technology integration- each strategy will include an App. that could be used with the strategy or as an extension. Picture/Trade Book Share 10% Each student will select a picture book with the class that would serve as an appropriate alternative text for their content area classroom. (This will be after you have evaluated a textbook.) A 1-2 page reflective paper will be required that addresses various aspects of the selection process and how you would use this book within your content area. Exams 20% There will be a mid-term and final exam. Each will be worth 10%. The midterm will be over SM ch. 1-4 and 6, B 1-5. The final exam will be over SM ch. 5 and 7-12, B Professionalism 5% Attendance, punctuality, preparedness, and active participation are expected. It is essential that students meet all requirements set forth for the course. The instructor reserves the right to modify the syllabus and assignments for this course. Course Assessment Components: *We will meet in class for all meeting dates unless otherwise stated. 7 COURSE AND UNIVERSITY PROCEDURES AND POLICIES Drop Policy. If you discover that you need to drop this class, you must go to the Records Office and ask for the necessary paperwork. Professors cannot drop students; this is always the responsibility of the student. The record s office will provide a deadline for which the form must be returned, completed and signed. Once you return the signed form to the records office and wait 24 hours, you must go into Warrior Web and confirm that you are no longer enrolled. Should you still be enrolled, FOLLOW- UP with the records office immediately? You are to attend class until the procedure is complete to avoid penalty for absence. Should you miss the deadline or fail to follow the procedure, you will receive an F in the course. Academic Integrity. Texas A&M University - Central Texas values the integrity of the academic enterprise and strives for the highest standards of academic conduct. 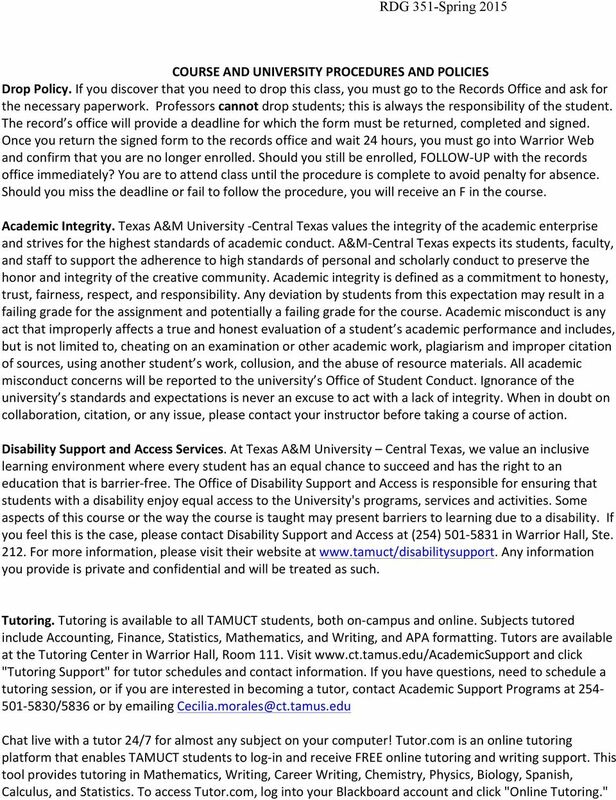 A&M- Central Texas expects its students, faculty, and staff to support the adherence to high standards of personal and scholarly conduct to preserve the honor and integrity of the creative community. Academic integrity is defined as a commitment to honesty, trust, fairness, respect, and responsibility. Any deviation by students from this expectation may result in a failing grade for the assignment and potentially a failing grade for the course. Academic misconduct is any act that improperly affects a true and honest evaluation of a student s academic performance and includes, but is not limited to, cheating on an examination or other academic work, plagiarism and improper citation of sources, using another student s work, collusion, and the abuse of resource materials. All academic misconduct concerns will be reported to the university s Office of Student Conduct. Ignorance of the university s standards and expectations is never an excuse to act with a lack of integrity. When in doubt on collaboration, citation, or any issue, please contact your instructor before taking a course of action. Disability Support and Access Services. At Texas A&M University Central Texas, we value an inclusive learning environment where every student has an equal chance to succeed and has the right to an education that is barrier- free. The Office of Disability Support and Access is responsible for ensuring that students with a disability enjoy equal access to the University's programs, services and activities. Some aspects of this course or the way the course is taught may present barriers to learning due to a disability. If you feel this is the case, please contact Disability Support and Access at (254) in Warrior Hall, Ste For more information, please visit their website at Any information you provide is private and confidential and will be treated as such. Tutoring. Tutoring is available to all TAMUCT students, both on- campus and online. Subjects tutored include Accounting, Finance, Statistics, Mathematics, and Writing, and APA formatting. Tutors are available at the Tutoring Center in Warrior Hall, Room 111. Visit and click "Tutoring Support" for tutor schedules and contact information. If you have questions, need to schedule a tutoring session, or if you are interested in becoming a tutor, contact Academic Support Programs at /5836 or by ing Chat live with a tutor 24/7 for almost any subject on your computer! 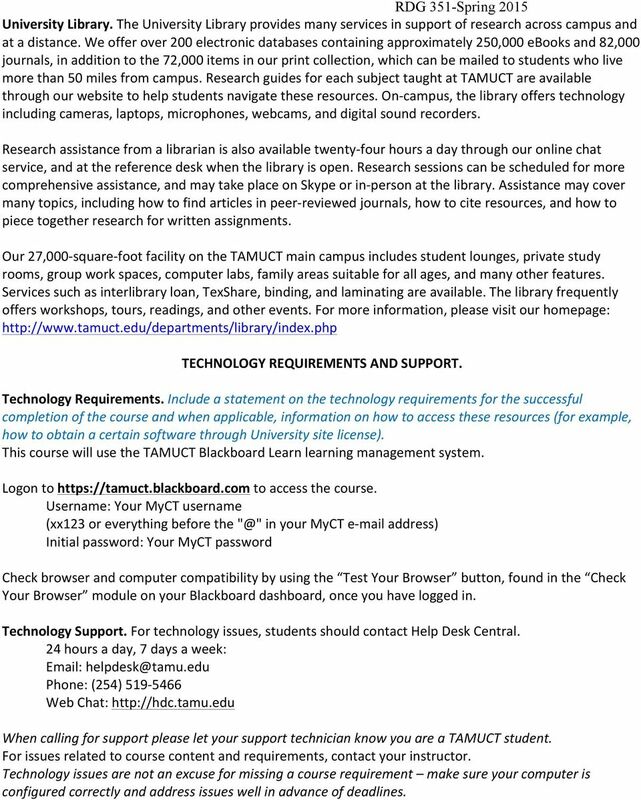 Tutor.com is an online tutoring platform that enables TAMUCT students to log- in and receive FREE online tutoring and writing support. This tool provides tutoring in Mathematics, Writing, Career Writing, Chemistry, Physics, Biology, Spanish, Calculus, and Statistics. To access Tutor.com, log into your Blackboard account and click "Online Tutoring." 8 University Library. The University Library provides many services in support of research across campus and at a distance. We offer over 200 electronic databases containing approximately 250,000 ebooks and 82,000 journals, in addition to the 72,000 items in our print collection, which can be mailed to students who live more than 50 miles from campus. Research guides for each subject taught at TAMUCT are available through our website to help students navigate these resources. On- campus, the library offers technology including cameras, laptops, microphones, webcams, and digital sound recorders. Research assistance from a librarian is also available twenty- four hours a day through our online chat service, and at the reference desk when the library is open. Research sessions can be scheduled for more comprehensive assistance, and may take place on Skype or in- person at the library. Assistance may cover many topics, including how to find articles in peer- reviewed journals, how to cite resources, and how to piece together research for written assignments. Our 27,000- square- foot facility on the TAMUCT main campus includes student lounges, private study rooms, group work spaces, computer labs, family areas suitable for all ages, and many other features. Services such as interlibrary loan, TexShare, binding, and laminating are available. The library frequently offers workshops, tours, readings, and other events. For more information, please visit our homepage: TECHNOLOGY REQUIREMENTS AND SUPPORT. Technology Requirements. Include a statement on the technology requirements for the successful completion of the course and when applicable, information on how to access these resources (for example, how to obtain a certain software through University site license). 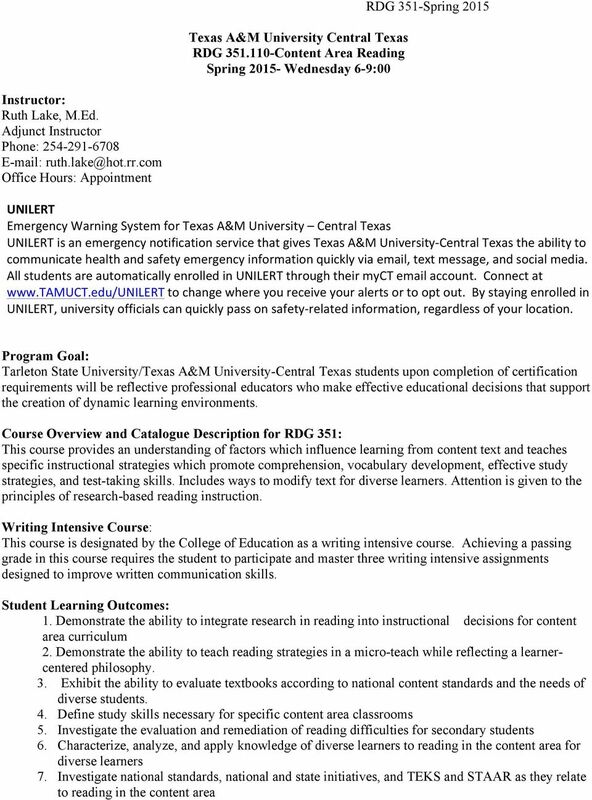 This course will use the TAMUCT Blackboard Learn learning management system. Logon to to access the course. Username: Your MyCT username (xx123 or everything before the in your MyCT e- mail address) Initial password: Your MyCT password Check browser and computer compatibility by using the Test Your Browser button, found in the Check Your Browser module on your Blackboard dashboard, once you have logged in. Technology Support. For technology issues, students should contact Help Desk Central. 24 hours a day, 7 days a week: Phone: (254) Web Chat: When calling for support please let your support technician know you are a TAMUCT student. For issues related to course content and requirements, contact your instructor. Technology issues are not an excuse for missing a course requirement make sure your computer is configured correctly and address issues well in advance of deadlines. 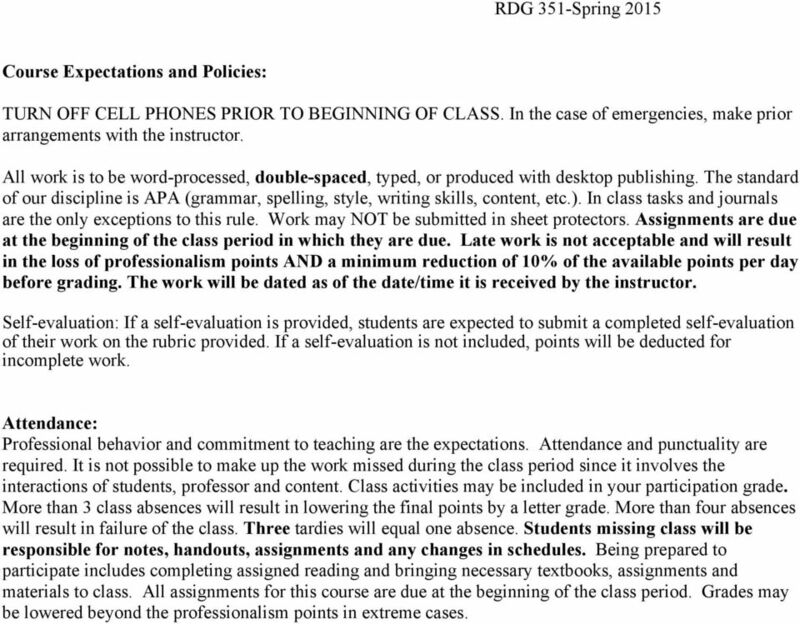 9 Course Expectations and Policies: TURN OFF CELL PHONES PRIOR TO BEGINNING OF CLASS. In the case of emergencies, make prior arrangements with the instructor. All work is to be word-processed, double-spaced, typed, or produced with desktop publishing. The standard of our discipline is APA (grammar, spelling, style, writing skills, content, etc.). In class tasks and journals are the only exceptions to this rule. Work may NOT be submitted in sheet protectors. Assignments are due at the beginning of the class period in which they are due. Late work is not acceptable and will result in the loss of professionalism points AND a minimum reduction of 10% of the available points per day before grading. The work will be dated as of the date/time it is received by the instructor. 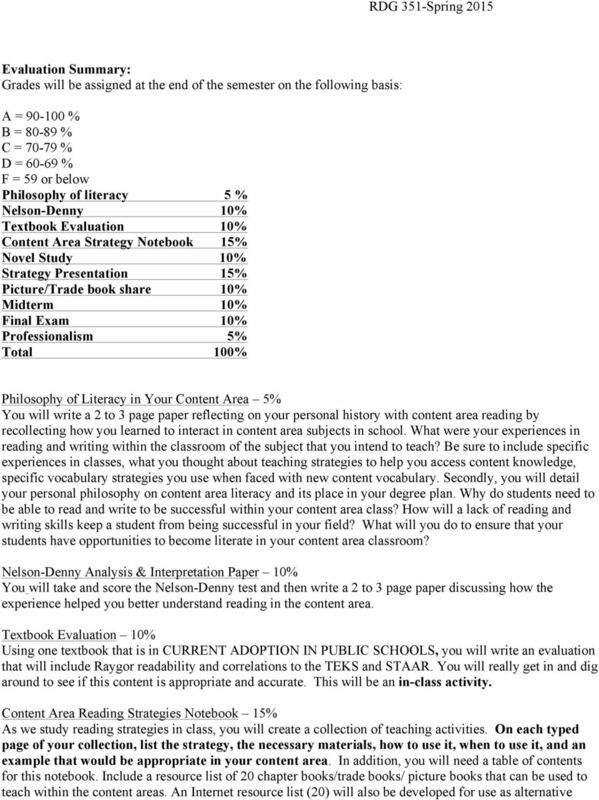 Self-evaluation: If a self-evaluation is provided, students are expected to submit a completed self-evaluation of their work on the rubric provided. If a self-evaluation is not included, points will be deducted for incomplete work. Attendance: Professional behavior and commitment to teaching are the expectations. Attendance and punctuality are required. It is not possible to make up the work missed during the class period since it involves the interactions of students, professor and content. Class activities may be included in your participation grade. More than 3 class absences will result in lowering the final points by a letter grade. More than four absences will result in failure of the class. Three tardies will equal one absence. Students missing class will be responsible for notes, handouts, assignments and any changes in schedules. Being prepared to participate includes completing assigned reading and bringing necessary textbooks, assignments and materials to class. All assignments for this course are due at the beginning of the class period. Grades may be lowered beyond the professionalism points in extreme cases.